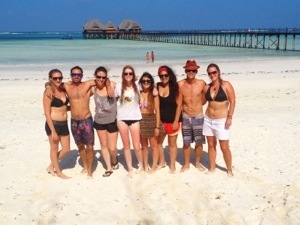 The next morning, 8 of us split off from the tour group and spent three days on the East coast of Zanzibar. Nick and Sandy were good enough to do some research and book us all into a little backpacker hostel called Mustafas. The place was wicked. A super laid back Rastafarian joint that had quaint little bungalows, sandy paths, a huge fire pit and a bar/restaurant for everyone to relax at. The bar had a constant stream of Bob Marley tracks blasting out into the courtyard, and a steady supply of semi-cold Kilimanjaros (our favourite beer here). The locals who worked and hung out there each introduced themselves by their strange nicknames: Shaggy Dog, Scooby Doo, Slim Shabby, and the such. 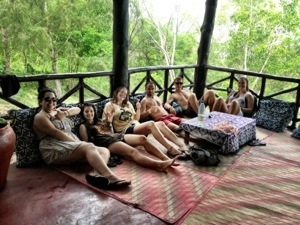 They spent most of the day smoking hash, lounging about, and serving us food and drinks as we needed. Life is sweet. On our first afternoon, we walked the half block to the beach for a swim. The tide was way out, so mostly we just trudged through clay-like mud until we could find a deeper spot to wade in. That’s where we met Shaggy Dog: the supplier of all tourist needs! 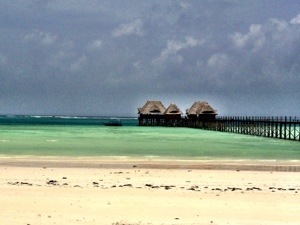 The know-it-all of East Zanzibar! He could get us scooters, bicycles, snorkels, paddle boards, kite surfing, or a large assortment of illegal drugs and have everything organized in a matter of minutes. The boys had already done introductions by the time Kelsi and I waded up through the water. “Hilary” I replied as I shook his hand. We told Shaggy Dog we were going to take it easy, but we’d chat with him the following day about activities. That day, we took it slow. 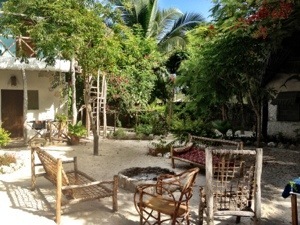 Finally a day to lounge at the hostel, relax in the surf and walk along the vast stretches of white sand beaches. The water in Zanzibar is a beautiful turquoise blue colour that I wasn’t quite expecting from the coast of Africa. It was paradise. We all went to a local restaurant for dinner, waited over an hour for our meals (despite being the only people in the place) then spent the night laughing by the fire. 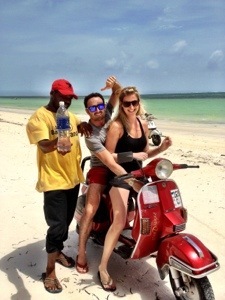 One of the local guys, who we nicknamed “Colgate” because he only had 3 functioning teeth, took a liking to Sandy which resulted in more fits if laughter from us girls. Colgate spent the evening dancing, playing the bongo, and offering up flowers and coconuts to him. Endless amounts of entertainment! We finally had to escape for a midnight dip in the ocean and lie out on the sand watching the stars well into the night. The next day we collectively agreed to rent scooters for the day. 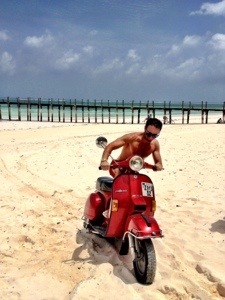 Although we couldn’t drive the scooters on the roads without a permit, Shaggy Dog said it would be no problem just cruising up and down the beach. Falafel (Mallory’s nickname because she is a vegetarian) was our only voice of reason in the group. “Guys, none of us know how to drive scooters, we don’t have permits, we don’t know the condition of the bikes, I’m not coming”. So Kelsi and I sat and tried to explain our unreasonable side. If we were going out, we were bringing the whole dirty 8, no man gets left behind! In the end, we did convince her to join us. We rented four scooters between the 8 of us and trudged to the beach. Immediately afterwards the boys taught us all how to drive (being the only 2 people qualified enough to work a scooter). And yes, even I drove a motorized, 2-wheeled vehicle for a little while. When we’d all practiced for a few minutes, we decided to head out 6km or so north to the Blue Lagoon. We hopped on the bikes and started out. Sarah jumped on the back of Nick’s bike, and as he started revving forward, she leaned back and the two of them flipped backwards, the bike, with wheels still spinning, crushing them from above. “Help!!! Help! Get it off!” Sarah yelled at Nick. “I can’t! You have to let go of me! !” Unfortunately, Kelsi and I were already driving up the beach, and so I missed actually seeing this. But apparently it was fits of shrieking from Sarah as she death clutched Nick’s waist so he was unable to move… Everyone else just stood around and watched and laughed. Minor cuts and bruises resulted from the accident, and the two of them were up and speeding down the beach in no time. It was hot that day, and the wind blowing in my ears made it impossible to hear what Kelsi kept talking about as we drove along the surf line. A few minutes down the beach I heard Kelsi yelling something. “What? !” I yelled. “Your helmet? What’s falling off? Should I hold it on for you” Then I looked up and realized what she was talking about. 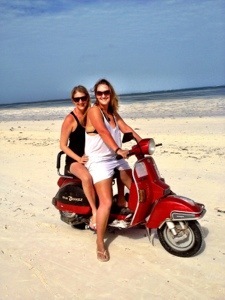 Cara and Mel had drifted too close to the water and hit some soft sand. The bike swerved, stopped short and sent the two of them flying over the handle bars. Mel did a full front flip from the back of the bike and landed in the water. Cara hit the handle bars during her ejection and skidded face first into the sand. Kelsi and I pulled up moments after Sandy and Falafel to find the bike upside down in the sand and the two girls walking around in a shocked daze. “Ya… We just crashed” they said, all too calmly. Cara was walking around in a crooked line, her face half covered in sand, lip bleeding and a mangled nose ring hanging from her nostril. Mel was just soaked, trying to take off her helmet as she walked back up to the beach. We hugged them both, made sure everyone was okay, flipped the bike back into an upright position and sat on the beach laughing for a good five minutes. “How fast were you two GOING? !” We asked. “Don’t know, but we were in 4th gear.” Said Cara. Turns out, the bike engine was flooded and the front wheel was crooked. The girls were still a little shaken, but in amazing spirits. We hopped in the water for a swim, washed Cara’s face off, and made bets on how bad her black eye would be the next day. The bike wouldn’t start. We dreaded how much it was going to cost us when we brought a busted bike back to Shaggy Dog. Falafel shook her head at us and reminded us of our “what could possibly go wrong speech”. Oops! Luckily for us all, a half hour later the girls were able to kick start the bike and we set out (at a much slower speed) to find Nick and Sarah at the lagoon. In the end we never found it. But we did come upon a beautiful light blue cove with a resort that was absolutely stunning. A dock went out into the middle of the water and had a restaurant floating above the ocean at the end of it (For guests of the hotel only). 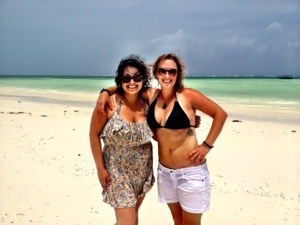 We went for a long swim, lay down in the lounge chairs, and eventually stopped at a restaurant on the beach for lunch. The seafood in Zanzibar is incredible. Actually, I think we only ate seafood for the entire four days we were on the island. The restaurant we were at served this delicious octopus curry that blew my mind. We actually ended up eating there the following day as well, where 4 of us ordered the octopus dish a second time. After lunch we packed up and headed home (Cara and Mel a half hour slower than the rest of us). The damaged bikes were no big deal and cost us just a few dollars. The rest of the night was spent lounging around. We had another campfire party, which ended up turning into a tiger balm massage party after not too long. (Mel gives incredible tiger balm head massages that became a continual necessity for the rest of the trip). On our final day in the East we were determined to find the real Blue Lagoon. So we rented slightly safer bicycles, got some vague directions from one of the staff and set out along the road. All of the locals in Zanzibar are so lovely. Nearly every man, woman or child we passed greeted us muzungus with an excited “Jambo!” and a wave. It felt nice to be so welcomed in their community. After 45 minutes of biking in the scorching sunshine, we finally came upon the “Blue Lagoon” sign. We were all excited! Exhausted from the biking, parched, and sunburnt from the midday heat, all we wanted to do was jump in a lagoon and cool off. We biked down the rocky path that the sign pointed to, came around a building, and realized we were at the EXACT same location that we’d been at the afternoon before. Fail. 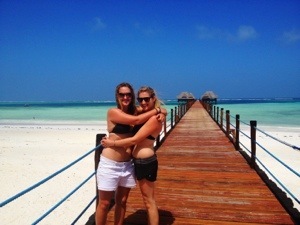 Apparently “lagoon” doesn’t have quite the same meaning in Africa as it does other places; but we weren’t complaining! We rented some snorkels, lounged around, and ate more delicious octopus curry. When we arrived back home we started drinking: sipping on Killis in the shade throughout the late afternoon. We asked around for a good place in town to eat, and were given the name if this great little place about a 20 minute drive away. We were getting pretty tipsy by the time our cab arrived. The 8 of us piled in and our driver blasted ear deafening tunes the entire way. When we got to “town” (aka, a slightly more dense area than where we already were) all we wanted was another beer. Too bad. On an island where 95% of the population is Muslim, many of the restaurants opt out of serving alcohol. This restaurant was one of those. So we sat, for ages, waiting for our food to come out, and began to sober up. We had joked all weekend that our food only showed up once the candles on our table had burnt out. But when the ones that night were getting very close to the end, our server laid fresh ones out… Looks like we were going to be waiting a long time to eat. In our drunken hunger, we all ordered way too many dishes. Pizzas, pasta, seafood, chips, etc. all started filling the table. Us girls filled up quickly and gave all our leftovers to the boys. I’m not sure I’ve ever seen two people eat so much before. We could feel their pain as beads of food sweat ran down their foreheads. In the end, not a scrap of food was left; not even the pizza slice that had fallen off the plate and landed on the dirty table. A couple hours later we piled back into the sub woofer that was our taxi and headed for home. We sat on the rooftop of our little bar and played a wild game of Kings cup. Part way through, Scooby Doo came to join us for drinks. Scooby was this laid back, dreadlocked Rastafarian that may or may not have worked at Mustafas. He did however sleep on the couch on the roof of the bar, and seemed pretty content smoking weed all day and chatting with the tourists. Scooby was pretty drunk when he joined in our drinking game, when we had finished, he was beyond wasted. At one point we apparently offended him and he blew up at us. “I hate you all! No one has a heart here! Screw all you guys! Only Sarah and I have feelings!” (How he targeted Sarah as his favourite we have no idea). No matter how much talking down we did, Scooby just got more angry. Finally he stormed off in a fit of expletives and left us wondering what had just happened. Hours later, at about 3:30 in the morning, he stumbled upon us on the beach with a machete. He angrily hacked away at any lamp posts or palm trees he could find in a blind rage… Perhaps it’s time to leave Mustafas. So we waited til he passed, went to bed, got up early and checked out. At 8:00 am Scooby was already awake and stoking the fireplace. We tiptoed around him, not quite knowing what he remembered from the night before. As we snuck out the front gates of the hostel we could here him yelling to us. Omg. What a crazy man. We climbed into our van, exhausted, and made the hour and a half trek back to Stone Town. Time to get the hell out of Zanzibar. What a weekend! 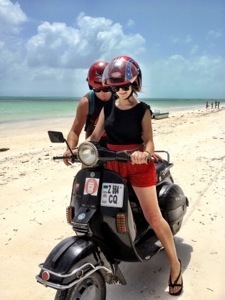 This entry was posted in Africa, Tanzania and tagged beach, scooters, Travel, Zanzibar by hilarylust. Bookmark the permalink.